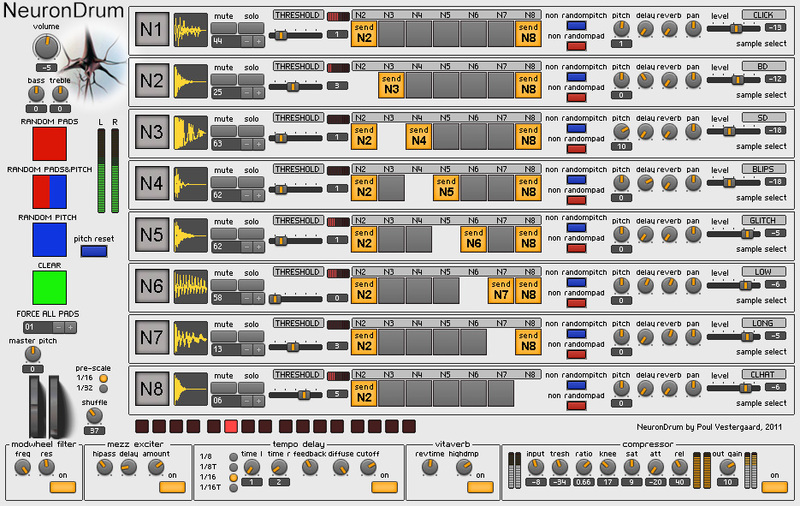 NeuronDrum is a sample based rhythm composer. It has 512 audio samples 32MB. Most of the sounds are made for electronica music. All rhythms is made of a neuron based approach with 8 neurons. Neuron 1 has 64 metronome kind of sounds. Neuron 2 has 64 bass drum sounds. Neuron 3 has 64 snare drum sounds. Neuron 4 has 64 kind of short blips sounds. Neuron 5 has 64 short glitch sounds. Neuron 6 has 64 low pitched tom like sounds. Neuron 7 has 64 long effect like sounds. Neuron 8 has 64 different closed hihat sounds. The first neuron works as a kind off metronome. All neuron can send impulses to each other. Every neuron has a threshold value. and send impulses to other neurons. NeuronDrum will recieve midi note on at all 8 neuron, but thats only if it's used as soundmodule. NeuronDrum will send midi notes from its rhythmgenerator. It will syncronize to midisongposition, but will only be accurate from start of the song. caused by the nature of this way of generating rhythm patterns. NeuronDrum has 5 effect unit. use the send buttoms for each neuron to send to other neurons. set the threshold values according to how often you want that neuron to excite.